WEST CHESTER – Meals on Wheels of Chester County announced it has partnered with Concordville Subaru (Route 202 in Concordville, just south of U.S.-1 in Chadds Ford) this holiday season to fight senior hunger. 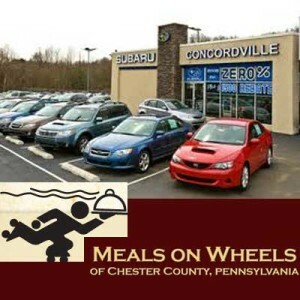 Meals on Wheels of Chester County will be at Concordville Subaru at various times during the campaign period to provide information to the public on our local program. A team of Subaru employees has volunteered to help deliver our hot, nourishing lunches during the event. This local effort is part of the Meals On Wheels Association of America’s (MOWAA) participation in the national Subaru of America, Inc. “Share the Love” Event. “We are very excited to work the team at Concordville Subaru to increase the public awareness of the Subaru Share the Love Event, our local Meals on Wheels program and continue to serve the homebound residents of Chester County,” said Jeani Purcell, Director, Meals on Wheels of Chester County. As one of the five Subaru “Share the Love” Event charitable partners, the Meals On Wheels Association of America (MOWAA) is awarding $200,000 in “Share the Love” grants to local Meals On Wheels programs that partner with Subaru dealerships in the fight to end senior hunger. Meals on Wheels of Chester County is eligible to win a MOWAA-Subaru “Share the Love” grant of up to $35,000 to help provide nutritious meals to homebound seniors in Chester County, PA. The Subaru “Share the Love” Event runs from November 21, 2012 to January 2, 2013. Subaru is donating $250 for every new Subaru vehicle sold or leased during “Share the Love” to the customer’s choice of one of five charities, including MOWAA. Over the past four years, proceeds from the Subaru “Share the Love” Event have provided funds to MOWAA to support its vision to end senior hunger by 2020.